Webinars take place at the day and time of your choosing. You can select a topic from the list below. Or, we can customize the webinar to fit your exact needs. Here are the topics that we can cover during a 60- to 90-minute webinar. Sometimes, clients request an overview of data visualization. Other times, clients request a deep dive on a certain topic, like using color strategically in visualizations. Pivot tables are the fastest, easiest way to make sense of spreadsheets. In this webinar, you’ll practice creating pivot tables; running descriptive statistics; and ensuring that your pivot table still works even after you’ve updated your dataset. Have you exhausted Excel’s limited menu of graphing options? We’ll build graphs that aren’t traditionally available within Excel, like dot plots, population pyramids, waffle charts, and diverging stacked bar charts. Craft your presentation’s story so that it sticks; include visuals like icons, photographs, and graphs to make your content more memorable; color-code your content so that your audience knows when a new chapter is beginning; and storyboard your slides so that your story shines. 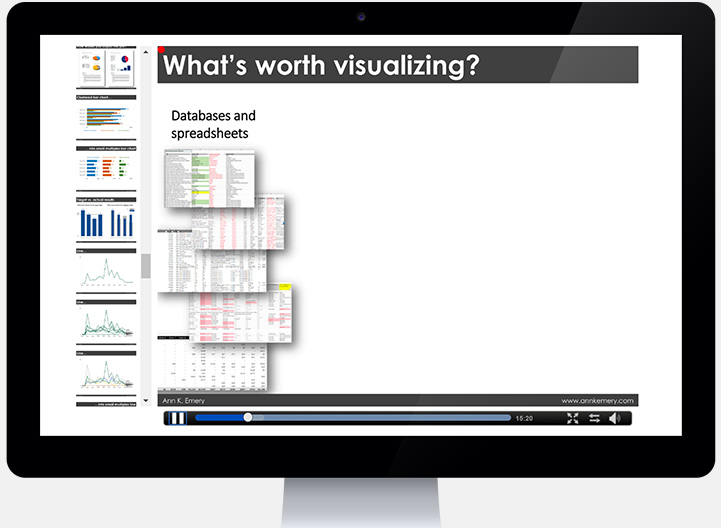 Are you ready to move beyond boring bar charts? You’ll get exposed to new styles that are sure to make your data shine, like dot plots, small multiples layouts, Sankey diagrams, network maps, and geographic maps, as well as options for visualizing your organization’s qualitative data. Color is about more than making your visualizations look pretty. You’ll learn how color can enhance branding and guide viewers’ eyes to the most important pieces of the graph, all while being legible when photocopied in black and white and for people with colorblindness. Sharing preliminary results through data placemats makes your data more likely to be understood, interacted with, and used. You’ll learn about the three phases of the data placemat process, which involve displaying preliminary findings in placemats; facilitating a data interpretation meeting; and incorporating feedback into your final deliverable. Have you ever needed to design a series of matching dashboards—one per program, school, or state? Copying and pasting is tedious and destined for typos. Instead, produce a series of matching dashboards through the magic of lookup functions and drop-down menus. Produce more effective reports with the 30-3-1 approach; rearrange your Table of Contents to emphasize the study’s results; and design visuals with grid systems, text hierarchies, and intentional page breaks.